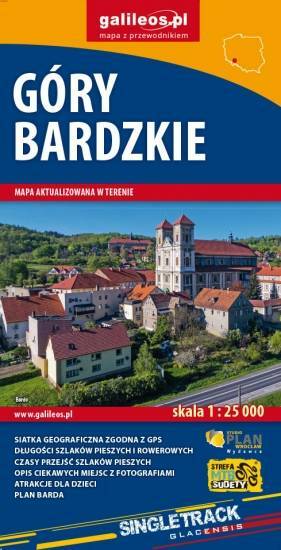 The Bardzkie Mountains are a mountain range in the Central Sudetes in the Lower Silesian Voivodeship, southern Poland. Ząbkowice Śląskie, Srebrna Góra, Bardo and Kłodzko are the biggest towns covered by the map. Tourist attractions, cycling and walking trails are marked on the map, as well as monuments, protected areas borders, accomodation facilities.